Most people have heard of bandwagon fans. Every time a new team rises to the top of the ranks in any given sport we see their jerseys, hats, tweets, posts, etc all over the place. The media probably feeds this phenomenon but I wouldn’t say that it causes it by any means. There is something inside people that makes them want to hop on the wagon. The bandwagon analogy doesn’t just pertain to the sports world either. With most every hobby, passion, ideology, philosophy, and much more, there is a bandwagon effect. I would say that bandwagons are harmless for the most part, and even fun to tease people about, until it involves critical aspects of someone’s life or becomes more of pattern in a person’s life. That is what this blog post is addressing. Behind the bandwagon effect lies a much deeper issue…insecurity. Bear with me here. By default, a person who jumps on the wagon is someone who wants to be associated with what is popular at the time. They might even be very outspoken about what is acceptable or praised in society at that moment. But, as we know, society changes about as often as teams rise and fall from prominence. To jump on and off the bandwagon is the easier path in life. One never has to be disappointed, weather hard times, go against the flow, or be challenged. It may be easier to live this way, but it is far less fulfilling, impactful, and authentic. It could also be said that these people are either absent of true conviction or too fearful to stand by them. Their insecurity drives their beliefs deep down so that they choose the crowd over conviction. In perspective, a bandwagon lifestyle is fake. It is a projected image that doesn’t match reality. The life is no more dangerous than when it comes to our faith in Christ. Just as a bandwagon fan, is no fan at all so too a bandwagon Christian is no Christian at all. And there are plenty of impostors out there wearing the Christian fan garb and speaking the Christianese language, but only when it’s safe, and only when it doesn’t require changing their lifestyle, and only when it doesn’t require standing up for truth. The title of this post is part of a quote from Malcolm Muggeridge, an English journalist. I believe it captures the bandwagon life. Those who follow the flow of society don’t have a promising future ahead of them. The fish who survive and have purpose, are those who choose to swim upstream, against the current. Few people choose the current, but those who are spiritually alive refuse the flow. That’s because Jesus is at the headwaters not the mouth of the river. I am not advocating anarchy or outright rebellion, but I am promoting the idea of being counter-cultural. There have always been, and I would venture to say, there always will be aspects of culture that is anti-biblical. So to be a Christian is to be counter-cultural. To be a Christian means we have to go against the flow for a lot of issues in society. To be a Christian means we will have to weather hard times and that the majority will criticize us at one point or another. To be a Christian means that we have the strength of the Holy Spirit to thrive in the midst of hostility and adversity. Jesus didn’t send us out into the world to flow with it, but to change it. And He promised that we wouldn’t go alone. The goal of the Christian is not the acceptance of society, but acceptance by the Savior. He wrote the rule book of life, not men. He decided right and wrong, not men. And what was right in the beginning of time will still be right when this world comes to an end. The judgement standard of this world is Jesus Christ, not cultural norms. What separates the bandwagon fans of Jesus and His die-hard followers will be whether or not they live that way. Besides, the bandwagon doesn’t pass through the pearly gates only those who followed Him in life do. Upon hearing some really hard news recently I started pondering the idea of God’s sovereignty and evil things happening in the world. It’s hard…really hard to reconcile those two things. The number one argument of people who don’t believe in God is that He can’t be both all-powerful and loving at the same time. I think even believers battle with that when tragedy strikes close to home or when we hear news of horrible things happening. But, God is loving and God is all-powerful. So then why do bad things still happen? Because of us. I’m not saying us in the sense of you and me, even though I’m sure we’ve all contributed to hurt in this world. I’m saying us in terms of all people. God isn’t the reason for pain and suffering, our own brokenness is. After all, He created things perfect and then humanity broke it. We sin, not God. We hurt people, not God. We are the selfish, self-seeking ones, not God. We wonder why we get sick and why illness plagues even the unborn. We are the ones destroying the environment by pouring chemicals into the air and water and producing toxic foods that poison our bodies. Sure, God allows hurt to happen but it’s always a result from humanity’s sin. The hardest thing is when someone who is innocent is affected by someone else’s sin. Yet that has been the story of human history. Whether it’s Adam and Eve’s selfish choice, Cain killing Abel, to the day to day pain we see inflicted in our world today, sin has been the cause for pain, not God. This world is fallen and broken, and yet, God stepped down into it by becoming flesh to walk among us. His desire to reach a world so lost and people so wicked (that’s everyone by the way) is the proof of Him being a loving God. Need more proof? He also allowed those wicked people to whip him and nail him to a cross and crucify Him. And all that so He could take the punishment that we all deserve. Where is God when bad things happen? He was hanging on a cross in the most excruciating pain so that we could be healed despite all the suffering this world offers. So if He’s loving He must not be all powerful. Well God didn’t stay dead! He was popping out of a grave three days later. God creates life. God makes things out of nothing. Everything that is alive owes every breath to Him. There is no greater power than that. Let me propose then, that we stop asking the wrong question of “how can a sovereign God let bad things happen” and instead ask “how can we be more selfless and be a part of the solution to the pain in the world”? 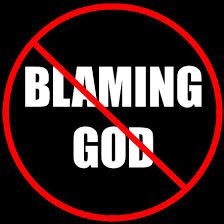 So let’s stop blaming God for not intervening and start pointing the finger where it really belongs. Let’s stop shaking our hands at heaven and instead, put them to work helping others. Let’s stop wondering why God doesn’t strike every evil doer down with lightning and remember that He has not dealt us our due punishment for our guilt. I heard someone say recently that God wants us to be the best version of ourselves. It sounds good at first, and almost biblical. But…I believe that it’s untrue none the less. Never once does the bible say that God’s goal for our lives is to be the best person we can. God doesn’t want us to be a better person, He wants us to be more like Jesus. The best human is still full of sin. No matter what the best version of us is, it will be a version that sins. Jesus is the image of God. He is perfection in every sense of the word, and the only way to please God is by having faith in Him. Therefore, being like Jesus is our goal in life. Being like Jesus is what the mission of the Holy Spirit is. Human flesh brings limitations but God’s Spirit transforms lives. Trying to be the best version of ourselves leads to people focusing way too much on…you guessed it…themselves. Some people even use it to justify their vanity. I heard one person a while back saying that they body build because God wants us to have the best bodies possible. Really? Jesus did not die on the cross so that we should devote our lives to getting ripped and toned. Some quote the bible saying the our bodies are a temple meaning we should try to be as beautiful as possible and have ___ amount of body fat and hit the gym and try the latest diet fads. We don’t need to “dress up for Jesus” when we go to church. We don’t need to have endless debate over piercings and tattoos. We are the temple…of the Holy Spirit. That in no way means that we need to perfect the image of the temple or devote our lives to covering every “flaw” that we perceive we have. It means that we house the most precious gift anyone could ever receive and that gift is meant to change everything inside us. Health is great, but holiness is better. And holiness only comes through Jesus. Let’s be clear…God won’t love you any more than He did when He died for you on the cross. In all of our ugliness and imperfection, God loved us. We have hope because of Jesus. We have life because of Jesus. We are made holy because of Jesus. Our life is now all about Jesus. In the bible, Jesus is literally called “our life”. We don’t need to look better or act better, we need a life connected to Jesus. We need His Holy Spirit to change us from the inside out. Then and only then will we be genuine and sincere in our love for others and our love for God. A life pleasing to God is not more of us, it’s more of Jesus in us. Live in the peace that His grace brings, knowing you’re already loved and accepted through Christ. Stop the striving to be a better you and run after Jesus and you’ll become better in every way.